Music festivals are a souring experience. I’d all but written off the idea of continuing to attend such events, which seem to grow a little more stagnant and bloated each year. The self-consciously diverse lineups, the rave-oriented accouterments — these stabs at pre-packaged fun and horizon-expansion began to take on, in my mind, an equivalency with the sort of misguided adolescent enlightenment quest that involves Dark Side of the Moon, The Wizard of Oz and acid. Then there are the givens one must tacitly accept: the masses of pushy Odd Future fanboys, the oppressive heat, the omnipresent fear of stepping in MDMA soaked vomit. So it took a rare animal, a music festival curated by trustworthy, gently trippy old Woodsist, to lure me back into the fold. 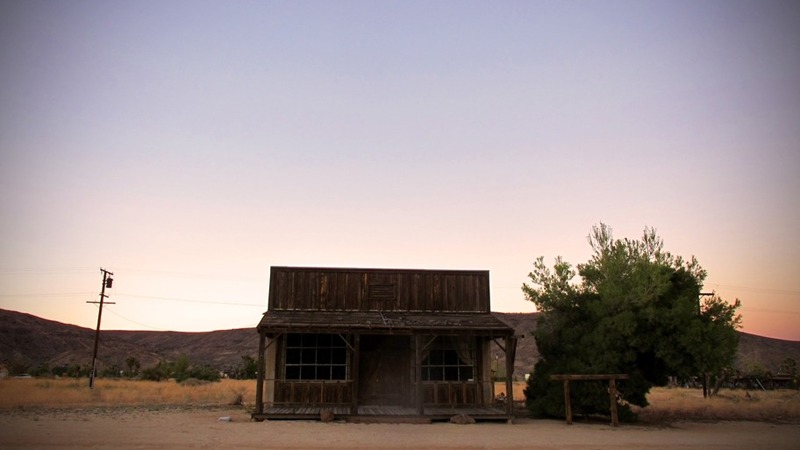 Tenting at Pappy & Harriet’s, an isolated venue located a couple hours east of central Los Angeles in the partially abandoned, Old Hollywood-funded cowpoke nook of Pioneertown, the label had basically assured that only the keenly interested would bother showing up. Even the intense local temperatures seemed somehow roped into the aesthetic, as blacktop mirage ripples beckoned us in. Folksy setting, intimacy, earnestness, all with a slant that was unwaveringly modest (sometimes to a fault), this was a music festival as a peyote-patterned security blanket. But early on, another, admittedly heinous, analogy started to take root: the music festival as a state of the label — the evolutions of those who had graduated from the Woodsist, and the indifference to change exhibited by some of the stalwarts. It might not be coincidental that the artists there who are most obviously in a state of flux — notably, Jessica Pratt and Ducktails — aren’t closely associated with the label. Pratt, for her part, seems to be heading into more cavernous and haunted passages, while still retaining a melodic fragility. Admittedly, early, abstract Ducktails records are just the kind of therapeutic brain-baths that helped me fill composition books with words and images during my dormitory years. But hearing Mondanile’s delay-drenched noodling congeal into sea-breeze-pretty pop over the years (a process which seemed to repeat itself in real-time during his stripped-down solo set of more structured, recent material) has had its own distinct pleasure. And to that end, current Domino-signees Real Estate, whose debut is – in my estimation – one of Woodsist’s key releases, played a relatively bold sequence of material featuring as many new songs as well-worn ones (though naturally, each unreleased song was introduced with a polite half-apology). Contrast this with the offerings of Real Estate’s bassist/crowd-warmer Alex Bleeker and his Freaks, who at least live, incarnate that “modest to a fault” side of Woodsist. “They’re like the good Grateful Dead albums,” I assured an uninitiated companion as sound checks ensued, thinking of the craftsmanship and warmth of American Beauty and Workingman’s Dead. They then dove headlong into a set more on the “Touch of Grey,” dancing teddy bears side of the legacy, provoking a nearby couple that appeared to be roughly around retirement age to remark on the commonalities of the Freaks and the Dead. Reverent interpretations of FM standards would be throughout the festival, from Ducktails’ take on “Jane Says” to a Bleeker-assisted Woods cover of “Have You Ever Seen the Rain?” This only amplified the approachability and familiarity of the whole affair, which is laudable enough, but occasionally felt like pandering to a crowd that was noticeably hungry for this stuff. By the time the Freaks launched into a post-ironic cover of “Walkin’ On Sunshine,” as well as a day-drunk rendition of “Let the Good Times Roll” (a live staple of the Dead’s waning years), I took it as a cue to make a brief desert sojourn, returning in time for the Fresh & Onlys, the sole logical choice for Best Dressed of Woodsist. Perhaps emblematic of the humble quality I take as a Woodsist signature, Woods themselves then unassumingly took on a set-time in the early evening, slated almost exactly in the middle of lineup. New songs have of course ambled their way into Woods’ live performances over the years, but their sets always seem to devote equal energy to bittersweet, campfire-lit pop and the occult feverishness of eerie backwater jamming. I’ve seen Woods shows in 2011, 2012 and 2013, and the only differences were surficial, with the general ebb and flow always remaining the same. All of which brought back to mind a litany of compliments I’ve dispersed to the label that, retrospectively, bore the taint of backhandedness. I’ve recently described Ducktails’ transitional 2011 LP Arcade Dynamics (and his only solo Woodsist full-length), as “surprisingly good, once you return to it without expectations.” Earlier this year, employing a bit of classic double-edged adulation when I reviewed Alex Bleeker and the Freaks’ So Far Away, I wrote that the record “practically introduces itself as a grower.” I’ve never liked giving albums ratings (as opposed to just sharing some thoughts about them), but I can say with certainty I’d give the same “4/5, solid as a rock” score to every Woods record, were I pressed to do so. And, while it may say more about my own spaceyness than anything, I’d probably fail some kind of quiz that asked me to match Woods songs to their respective albums. It’s not that I haven’t spent amble time with each record. It’s that their loose seams weave together into something as welcoming and tightly knit as a gas station-purchased drug rug. Funny, then, that the night should be capped by the Babies and White Fence, the two artists who best crystallize these competing notions of Woodsist. While there’s a certain romance to the Babies total rejection of ambition, right down to their regressive namesake, it’s hard not to feel minute pangs of remorse over what, up to this point, could be considered squandered potential. So many of my favorite lo-fi records are constructed on the bountiful theory of masking offhand brilliance with a layer of cool ambivalence, but the equation is only intermittently worthy of attention when the ambivalence outweighs the brilliance. Contrast this with White Fence, a project that, since its inception, has been bound only by a few parameters — 4-track recording, inspiration from ‘60s psych and ‘70s singer-songwriters, and, most importantly, the outer limits of Tim Presley’s imagination. I’ve also witnessed White Fence shows in each of the last three years, and each has been a punk-blues catharsis that’s just as much Johnny Thunders as it is Syd Barrett. But if you’re going to insist on repeatedly using the same tools and keeping up the same obsessions, it helps to be a master at churning out variations on your pet themes. Presley is, and the routes he takes to that catharsis are perpetually enlivened by sudden diagonal shifts. That said, while Presley’s roadmap may be the one I identify with most, I’m not anxious for anyone else in the Woodsist camp to follow his route. Ambiguous as some of my approval has been, the label has produced some of the records I’ve returned to most over the last several years. They also succeeded in making a trip to a place as inherently extraterrestrial as a desert-rotted, manufactured piece of Wild West inauthenticity feel inviting. Driving home through a continuously mutating Echo Park that, upon each visit, seems to have sprouted enough new appendages so as to make certain corners of it unrecognizable, the charm, or even necessity, of a label so steadfast in its identity was obvious enough.